The Provisional IRA had been attacking British Army patrols and convoys with roadside bombs regularly since the early 1970s. 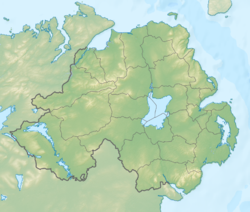 Most of these attacks took place in rural parts of Northern Ireland; especially County Tyrone (where the IRA's Tyrone Brigade was active) and southern County Armagh (heartland of the South Armagh Brigade). In August 1979, the IRA ambushed a British Army convoy with two large roadside bombs near Warrenpoint, killing eighteen soldiers. This was the deadliest attack on the British Army in Northern Ireland during the Troubles. In May 1981, five British soldiers were killed when their Saracen APC was ripped apart by a roadside bomb near Bessbrook, County Armagh. In July 1983, four British soldiers were killed when their vehicle struck an IRA landmine near Ballygawley, County Tyrone. In December 1985, the Tyrone IRA launched an assault on the police barracks in Ballygawley, shooting dead two officers and destroying the barracks with a bomb. As it was driving along the main road from Ballygawley to Omagh, at about 12:30AM, IRA members remotely detonated a roadside bomb containing 200 pounds (91 kg) of semtex. According to police, the bomb had been planted in a vehicle by the roadside and had been detonated by command wire from 330 yards (300 m) away. The blast hurled the bus 30 metres down the road and threw the soldiers into neighbouring hedges and fields. It left a crater 6 feet (1.8 m) deep and scattered body parts and twisted metal over a wide area. Witnesses described finding dead, dying and wounded soldiers strewn on the road and caught in the wreckage of the bus. Others were walking around, "stunned". Some of the first to arrive on the scene and offer help were loyalist bandsmen of the Omagh Protestant Boy's Band returning from a parade in Portadown, who had also been travelling in buses. Eight of the soldiers were killed and the remaining 28 were wounded. The soldiers killed were: Jayson Burfitt (19), Richard Greener (21), Mark Norsworthy (18), Stephen Wilkinson (18), Jason Winter (19), Blair Bishop (19), Alexander Lewis (18) and Peter Bullock (21). This was the single biggest loss of life for the British Army since the Warrenpoint ambush in 1979. An account from one of the survivors was published in Ken Wharton's book A Long Long War: Voices from the British Army in Northern Ireland, 1969–98. An inquest into the attack was told that the road was usually off-limits to military vehicles, due to the threat from the IRA. The driver of the bus, who was also a soldier, claimed he had been directed on to the road by diversion signs. The inquest heard that signs had not been placed by the police or the roads service. The IRA denied placing any signs and said that military buses often used the road. The mother of one of those killed accused the British military of negligence and claimed it was "trying to conceal the truth". Shortly thereafter, the Provisional IRA issued a statement claiming responsibility. It said that the attack had been carried out by its Tyrone Brigade and added: "We will not lay down our arms until the peace of a British disengagement from Ireland". The security forces suspected that an informer may have told the IRA of the bus's route and the time it would pass a specific spot. After the attack the British military decided to start ferrying their troops to and from East Tyrone by helicopter to avoid any future attacks like this. Tom King, then British Government's Northern Ireland Secretary, said there was "some evidence" that the explosives used were part of a consignment from Libya (see Provisional IRA arms importation). He also stated that the possibility of reintroducing internment was "under review". Libyan weaponry enabled the IRA to mount some of its biggest operations during its campaign. The Ballygawley bus bombing is believed to have been one of these attacks. Two months after the attack, the British Government introduced the broadcasting ban. It meant that the voices of Sinn Féin and IRA members were not allowed to be broadcast on television or radio. The Ballygawley bus bombing is believed to have influenced the Government's decision to introduce the ban. ^ a b "Sutton's Index of Deaths from the Conflict in Ireland: 1988". Conflict Archive on the Internet (CAIN). Retrieved 11 August 2010. ^ Sutton's Index of Deaths from the Conflict in Ireland: 1981. Conflict Archive on the Internet (CAIN). Retrieved 20 August 2013. ^ Northern Ireland: Death Cycle. Time, 1 June 1981. ^ A Chronology of the Conflict: July 1983. Conflict Archive on the Internet (CAIN). ^ a b c "IRA blast kills seven troops". Evening Times. 20 August 1988. ^ a b c d Lohr, Steve (21 August 1988). "IRA Claims Killing of 8 Soldiers As It Steps Up Attacks on British". New York Times. Retrieved 11 August 2010. ^ a b c d Yallop, Richard (22 August 1988). "IRA forces security review". The Age. ^ McDonald, Henry (6 September 2009). "Timeline: IRA attacks allegedly linked to Libya". The Guardian. London. Retrieved 11 August 2010. ^ A Long Long War: Voices from the British Army in Northern Ireland 1969-98. Goodreads. Retrieved 20 February 2014. ^ Pierce, Andrew (8 September 2009). "Britain's carefully crafted diplomatic relationship with Libya starts to unravel". Daily Telegraph. London. Retrieved 11 August 2010. This page was last edited on 2 April 2018, at 14:03 (UTC).